Welcome .............Thank you for visiting our page. We hope that you will consider joining us as we empower our community. Guilders get a great sense of fulfillment helping connect the Houston Area Urban League and the National Urban League to the community through volunteer service. We have FUN while serving the community! 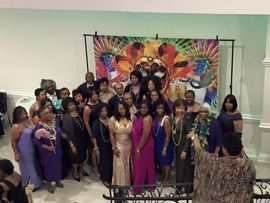 Some of our projects include coordinating the Masked Ball (an annual fundraiser for the Guild), coordinating health awareness and political participation projects, serving as mentors and tutors, and assisting with other projects consistent with the goals and objectives of the Houston Area Urban League. To obtain more information about the Guild and the Urban League, please complete a membership form or contact one of the officers. The Guild - the HEART AND SOUL of the Urban league movement. Houston Area Urban League Guild... Connecting the Houston Area Urban League and the National Urban League to the community. 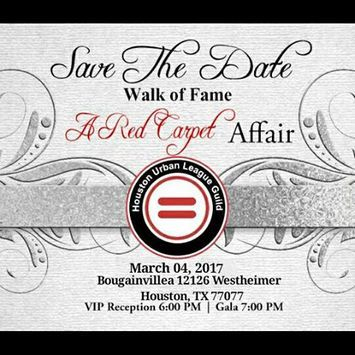 The Houston Area Urban League Guild’s Annual Red Carpet Affair: Walk of Fame is the primary fundraiser for the Guild. It is an evening of dinner and dancing with musical entertainment typical of a black tie gala. Dinner is a Cajun style buffet meal with cash bar service available throughout the evening. The Annual Red Carpet Affair: Walk of Fame will be held at Bougainvillea Event Center on Saturday, March 4, 2017. We expect between 200 – 300 guests from the community to attend the Gala.